One of the most deceptive types of taco here in the U.S. is the Pueblan taco arabe, which is often just a taco de harina. In Puebla, no vendor would ever dream of calling their taco de harina a taco arabe. The difference: a taco arabe uses a pita-style tortilla called pan arabe and the taco de harina employs a flour tortilla. In Puebla, there is a clear distinction between taco arabe, taco de harina, and the taco oriental, in which the same marinated and vertical spit roasted pork meat for a taco arabe is served on a corn tortilla. Here in L.A. you’ll find many Pueblan trucks and street vendors advertising the taco arabe but many are using a flour tortilla—oh, you roll your eyes, but yes my friend, we just don’t take these trespasses lightly in the taco lifestyle. So when I came across Tacos Alpique, a little family run hot dog stand turned taqueria in K-Town offering tacos arabes, I was skeptical. Sure enough, their taco arabe is a taco de harina. No need to call the taco police (oh, right, that’s me!) but I’m just going to call it a taco de harina. It’s delicious, luckily, so all is forgiven. 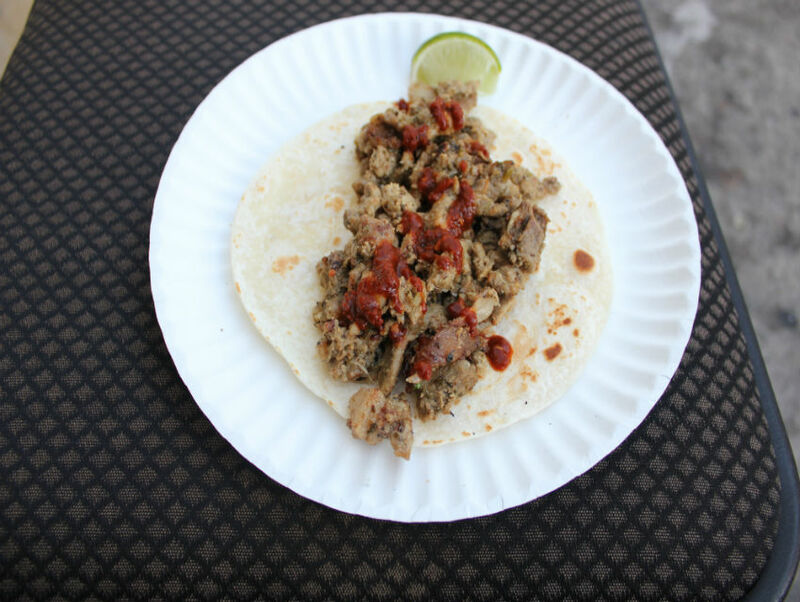 The pork isn’t cooked on a vertical spit but it very tasty, and offers a simple flavor of marinated pork with traditional chipotle sauce, wrapped in a flour tortilla that’s a departure from your usual taco stop where everything has onions and cilantro. L.A. has some great Pueblan restaurants and stands popping up lately and Tacos Alpique is a yet another reason to love tacos in L.A.
Next articleFull-Service Cheese Counters Stake Their Claim in L.A.